Bali The interior of Prana Spa is based on the image of the king legendary Radhistan. The atmosphere brings guests to the exotic world. You feel Prana Spa's wonder world which is unique and different from the other spas when you enter the Prana Spa throughout the elegant garden. It has the mysterious atmosphere which is created by the traditional Islam-style vivid color interiors. HIRO-chan and Prana Spa create the original menu! The package includes the popular Yoga Lesson for 1.5 hours, Prana Spa’s standard, Shirodara for 1 hour, and Body Care Massage for 50 min. We offer the Prana Spa’s special original package with reasonable price! The treatment begins with Prana Foot Ritual. Wash your foot with pepper mint water with roses and scrub them with sea salt. The massage is a mixture of Swedish and Balinese style which uses palms of hands and eases the tension of muscle. This original treatment is based on European style massage mixed with anti-aging method. The gentle massage helps to release old horny substance from your surface of the skin. Also, steam and moisture facial mask make your skin moist and younger. This course is not only for face but hand and arms. Shiro dara literally meaning “head flow” is one of the most desired Ayurvedic treatments. 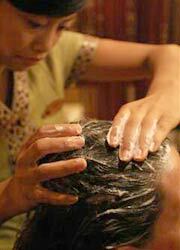 Beginning with a head, scalp, neck and shoulder massage, you will begin to calm the wandering mind. Meditative bliss will occur as a slow pouring of medicinal oils cascade over your sixth chakra, stimulating your third eye and window to thesoul. Recommended for headaches and insomnia, find out why this is one of the most profound and popular treatments offered. This is a unique 2 hours treatment to create a balance of body, mind and spirit together. In the Steam room, your skin gets refreshed by signature massage, face pealing and rain shower. The signature bodies massage at the end makes your stiff body relaxed. The best treatment if you want to relax mentally and fiscally. After massage, 1 hour of Shirodara makes will lead you to the calm condition. This therapy is for anyone who wants to refresh your mind and body. It’s also best for anti-aging. This package is to readjust natural elements of inside of the body with a cure of Ayurveda. Enjoy the relaxing time with the detoxing treatments. The most popular Ayurveda treatment with historical Indian healing technique. Meal to be healthy from inside of the body. This soft body massage can remove the physical pain that most pregnant women ego through. After the massage, enjoy cream bath for 1 hour with fresh herbal tea at the salon. ★ This treatment available for less 6 month pregnancy women. Enjoy the Special men’s treatment including deep pressure massage and cleansing and soft scrub to keep the skin clean and healthy. This popular course provides you a traditional Bali treatment. This 120 minutes course if to remove cellulite. Recommend for guest who want to cleansing your whole body. This course fixes your whole body balance and makes your skin clean and fresh. Your body, mind and soul become well-balanced and you get a perfect skin. Beginning with the hot and cold plunge pools to first invigorate and stimulate the circulation system. Then a relaxing foot treatment and continuing with our signature body massage to melt away any stress. The relaxed vibe continues with a full facial which seeks to balance skin, body and mind. Complete with a rhythmic scalp massage and hair crème bath. After massage with warm oil, you get improving blood circulation with herb and healing powder from India. In the end, they use a hot towel with special essence from herb to keep your body warm and relaxed. This soft body massage can remove the comfortableness pregnancy women go through and provide them a relaxing time. For those who prefer a strong pressure massage, we offer 90 minutes of deep tissue techniques drawing on Swedish Therapeutic, Hawaiian and Shiatsu Pressure Point traditions. Using historical stretching and Asian Tsubo massage technic, it adjusts an energy line called “Sen” inside of your body. This Thai Style Massage doesn’t use oil. A wear will be provided. This 90 minutes treatment based on historical Indian therapy which started 5000 years ago brings you into a relaxing mood mentally and physically. They put warm stones under the body and between toes. and essential oil to remove nervousness and anxiety. Once all the muscles are warmed up, you will feel calm and deeply relaxed. The treatment is also good for people who have dysfunctional blood circulation, arthritis and rheumatism. By this massage with warm basalt, it gently eases the tension of the muscle, so you will feel deeply relaxed not only mentally but also physically. Choose Sea Salt, Coffee, Lulur or Milk. It improves blood circulation and removes body wastes. Choose Seaweed or Cray. After putting the mask on, you will go into the steam room to improve detoxing. It helps to strain the body and keep well-balanced of it. There are 3 types of selections, Romantic Flower, Fresh Herbal or Exisotic Vanilla. They only use high quality essential oil for this special blended milk bath. It will make your skin deeply moisturized. Indulge in the healing of ancient Middle East traditions. The treatment begins with a foot cleanse followed by a cleansing back facial leaving the skin exfoliated and nourished, a foot massage is performed relieving the tension in your soles and leaves you floating on a magical carpet ride. Submerge your soles into a Nile of colours as your feet are cleansed, exfoliated and massaged atop a rainbow of precious stones. Fall into a tranquil state of luxury as your body is carefully and therapeutically massaged with the ultimate in luxury, 24 Karat Gold infused massage oil. Gold has long been admired for its therapeutic properties as well as its adoring beauty. This profoundly relaxing massage will evolve into the anointing of the seven chakras as select precious gemstones are placed on each energy centre to encourage flow of positive vibrations. Continue with a Genuine Pearl Facial of pure Pearl powder which will be masked upon your face to brighten and enhance this opulent facial. Attention will now be brought to the heavens as you experience the Crown Therapy, using warm oils and rosemary to nourish the scalp. This tranquil journey down the Nile is complete with a Legendary Cleopatra Milk Bath. Set sail on your quest to health and indulge in seven therapies from the sea. Your sea legs will be soaked in a mineral rich seaweed footbath and exfoliated with the oceans finest sea salt, continue with a relaxing therapeutic massage followed by a dry body exfoliation increasing the body’s circulation and leaving your skin soft and smooth before you are wrapped in the abundant proteins, vitamins and trace of minerals from the sea, your body will eliminate toxins while absorbing the benefits leaving you hydrated and balanced. Indulge into a luxurious pevonia Botanica Facial, this renowned sea element is rich in protein and powerful antioxidants which hydrate, firm and luminate the skin and continue with the Crown Therapy using warm oils and rosemary to nourish the scalp. Complete this voyage with a well deserved soak in a Marine Bath. Commence with a Foot Massage of the finest Persian rose water and petals and Royal Foot Cleanse, preparing you for your divine experience. For men, enjoy the King Shahryar massage, a powerful and firm massage that releases muscle tension and for the ladies, relax into the Queen Scheherazade massage which will bring the harmonious balance of body and soul. 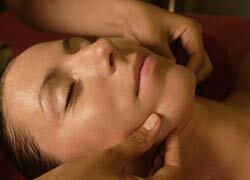 Now that the body and mind are relaxed and harmonious, experience a Royal Facial. The luxurious sea element is rich in protein and powerful antioxidants which hydrate, firm and luminate the skin continue with the Crown Therapy using warm oils and rosemary to nourish the scalp. Complete this journey with a private Kama Sutra or Relaxation Yoga session, focusing on relaxation and surrender to the deeper awareness of the breath. Soak as Kings and Queens in an exotically romantic bath infused with natural herbal aphrodisiacs. Free ONE WAY (from Prana spa) transportation is available if booking over Rp.1,500,000 treatment menu for Kuta, Jimbaran, Nusa Dua and Sanur area. (The total price will calculate special price. Also for 2 persons transport will free if booking price is total Rp.1,500,000. Please contact us for other area ). This transport is only one way from spa. Please prepare the own transport to come to spa. Prior transfer payment is needed 3 days before your departure. Please bear the expense of transfer by customer. My whole body was fresh and I felt good. There is a hair dryer available for free use at the waiting room. After treatment I could immediately go for shopping.